PROCEDURES RESULTING FROM THE COUNTY PLAN OF CRITICAL MANAGEMENT. 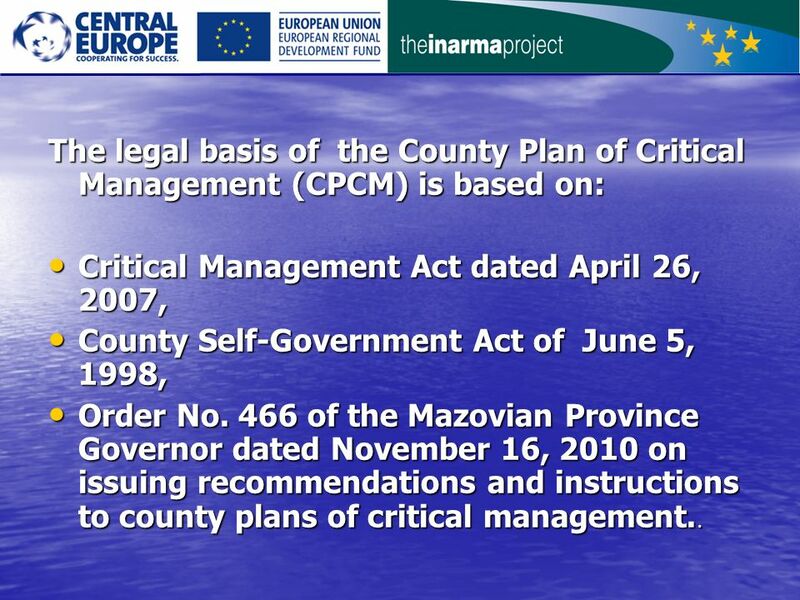 2 The legal basis of the County Plan of Critical Management (CPCM) is based on: Critical Management Act dated April 26, 2007, Critical Management Act dated April 26, 2007, County Self-Government Act of June 5, 1998, County Self-Government Act of June 5, 1998, Order No. 466 of the Mazovian Province Governor dated November 16, 2010 on issuing recommendations and instructions to county plans of critical management.. Order No. 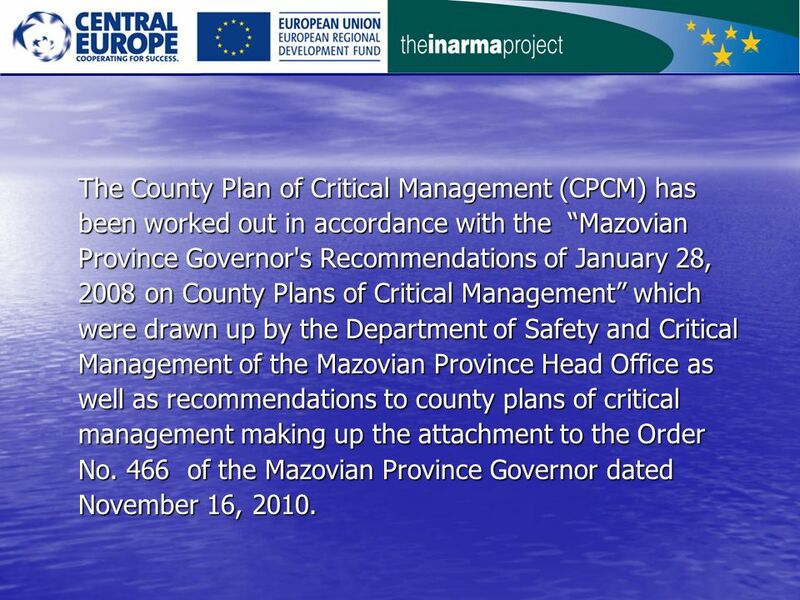 466 of the Mazovian Province Governor dated November 16, 2010 on issuing recommendations and instructions to county plans of critical management..
3 The County Plan of Critical Management (CPCM) has been worked out in accordance with the Mazovian Province Governor's Recommendations of January 28, 2008 on County Plans of Critical Management which were drawn up by the Department of Safety and Critical Management of the Mazovian Province Head Office as well as recommendations to county plans of critical management making up the attachment to the Order No. 466 of the Mazovian Province Governor dated November 16, 2010. 4 The County Plan of Critical Management serves the establishment and preparation, in the administrative territory of the County, of organizational and factual undertakings in the field of the critical management in case of arising of critical situations. The Plan aims at the optimum utilization of available forces and resources in critical situations as well as during states of emergency or during wartime – generally this Plan is to prevent critical situations, to take control over such situations, to properly react to such critical situations as well as to rehabilitate the demolished infrastructure and restore its original character. 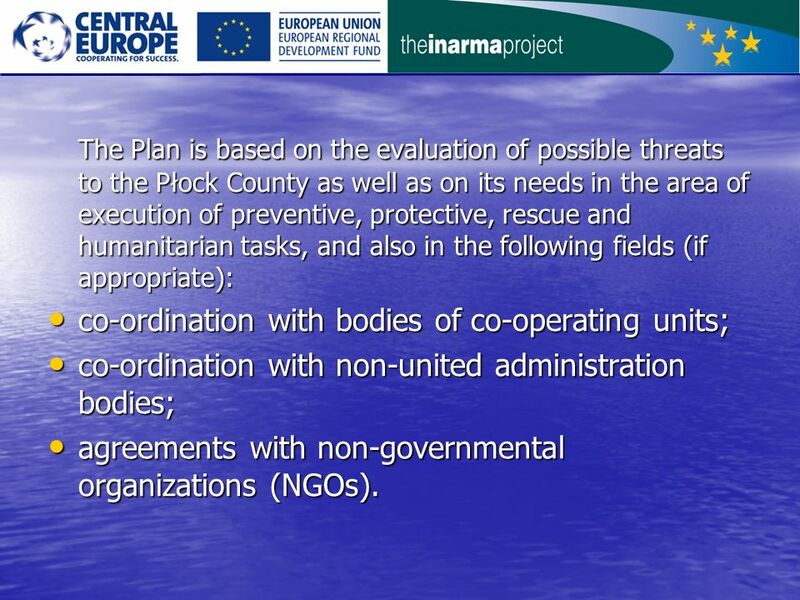 5 The Plan is based on the evaluation of possible threats to the Płock County as well as on its needs in the area of execution of preventive, protective, rescue and humanitarian tasks, and also in the following fields (if appropriate): co-ordination with bodies of co-operating units; co-ordination with bodies of co-operating units; co-ordination with non-united administration bodies; co-ordination with non-united administration bodies; agreements with non-governmental organizations (NGOs). agreements with non-governmental organizations (NGOs). 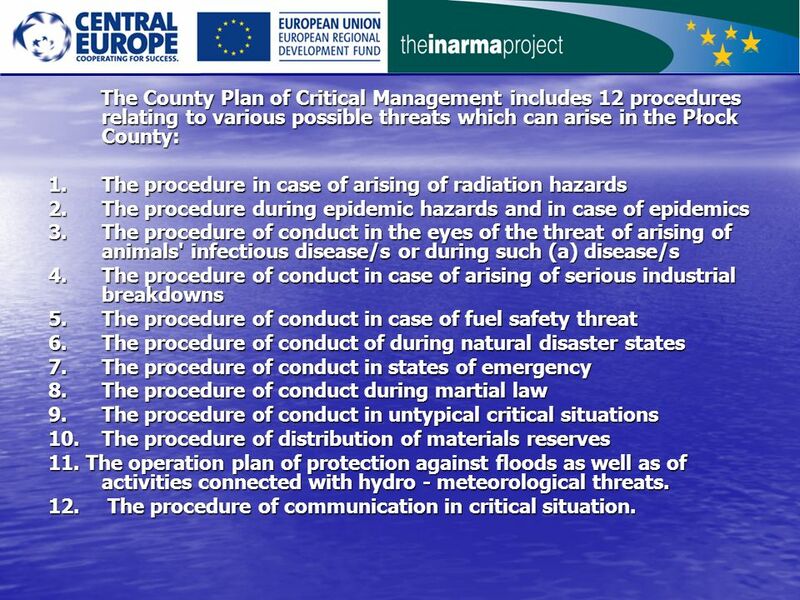 6 The County Plan of Critical Management includes 12 procedures relating to various possible threats which can arise in the Płock County: The County Plan of Critical Management includes 12 procedures relating to various possible threats which can arise in the Płock County: 1.The procedure in case of arising of radiation hazards 2.The procedure during epidemic hazards and in case of epidemics 3.The procedure of conduct in the eyes of the threat of arising of animals' infectious disease/s or during such (a) disease/s 4.The procedure of conduct in case of arising of serious industrial breakdowns 5.The procedure of conduct in case of fuel safety threat 6.The procedure of conduct of during natural disaster states 7.The procedure of conduct in states of emergency 8.The procedure of conduct during martial law 9.The procedure of conduct in untypical critical situations 10.The procedure of distribution of materials reserves 11. 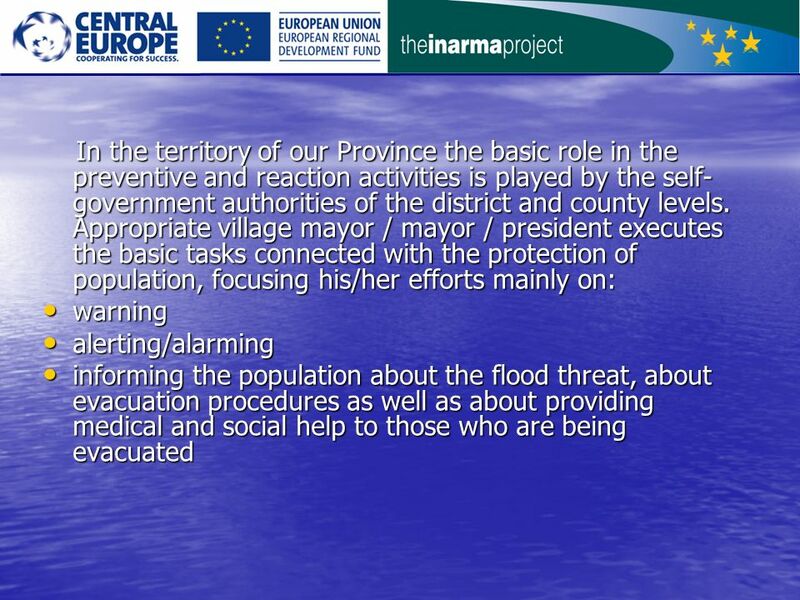 The operation plan of protection against floods as well as of activities connected with hydro - meteorological threats. 12. The procedure of communication in critical situation. 7 Taking into account possible threats caused by the destructive influence of natural forces in the territory of the Płock County it turns out that the largest threats result from floods which take place here in various seasons of the year. 8 Here are the legal basis of the anti-flood procedure implementation: 1.The Government Administration–in-Province Act dated June 5, 1998 2.The Water Law Act of July 18, 2001 3.The Order of the Minister of Environment dated August 2, 2007 on the entities and bodies to which the state hydrological - meteorological agency as well as the state hydrological agency are obliged to pass and transmit warnings, weather forecasts, announcements and bulletins, as well as on the methods and frequency of their delivery and/or transmission. 9 The aim of the procedure is the establishment of principles of conduct of the Province Governor and his/her subordinate units/services, inspection bodies and the fire brigade in case of arising of the flood threat or the very flood. 12 Under official order of the Province Governor the equipment and resources from the civil defence province store-houses are handed out whereas the equipment from the province anti-flood store-houses can be handed out under the order of the Province Marshal or his/her representative being a member of the Province Team of Critical Management. 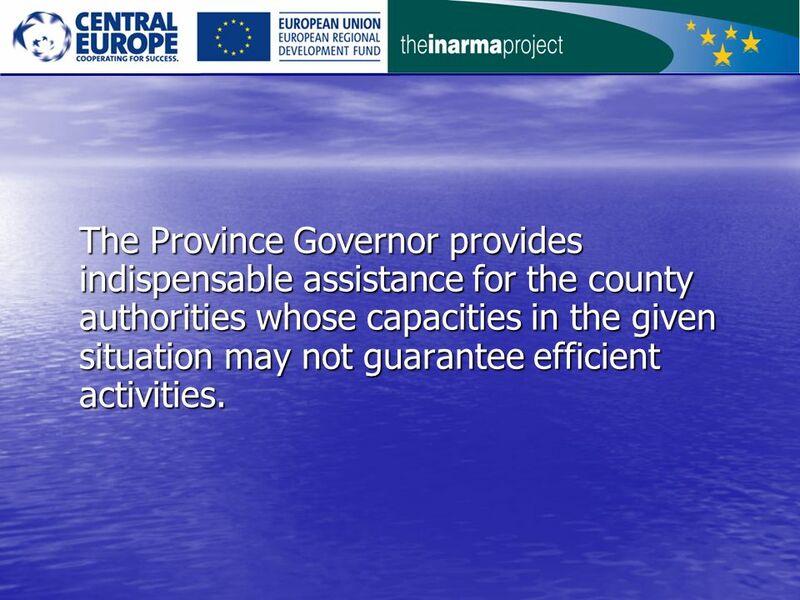 13 The Province Governor provides indispensable assistance for the county authorities whose capacities in the given situation may not guarantee efficient activities. 14 The equipment which is kept in the county anti-flood store-houses can be handed out by the Starost [County Head Person]. 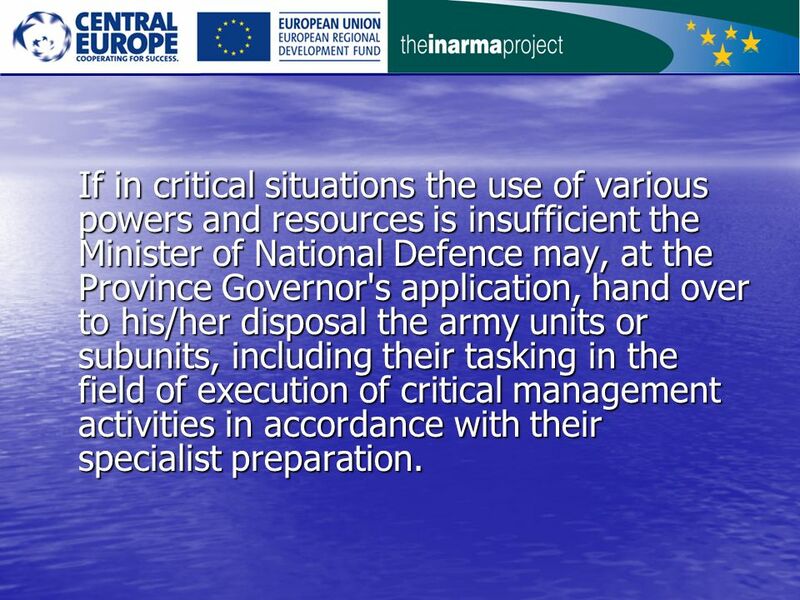 15 If in critical situations the use of various powers and resources is insufficient the Minister of National Defence may, at the Province Governor's application, hand over to his/her disposal the army units or subunits, including their tasking in the field of execution of critical management activities in accordance with their specialist preparation. 17 Under appropriate agreement convicts staying in penal institution can also be sent to a given threatened location to prevent and remove the results of natural disasters as well as other hazards threatening human life and requiring to undertake the rescue - defensive activities. 18 Should such a threat / hazard arise in the territory of the local authority unit, then the appropriate village mayor / mayor / president may put forward a motion to the Province Governor to provide help in the form of the rescue action support by convicts staying in penal institutions. 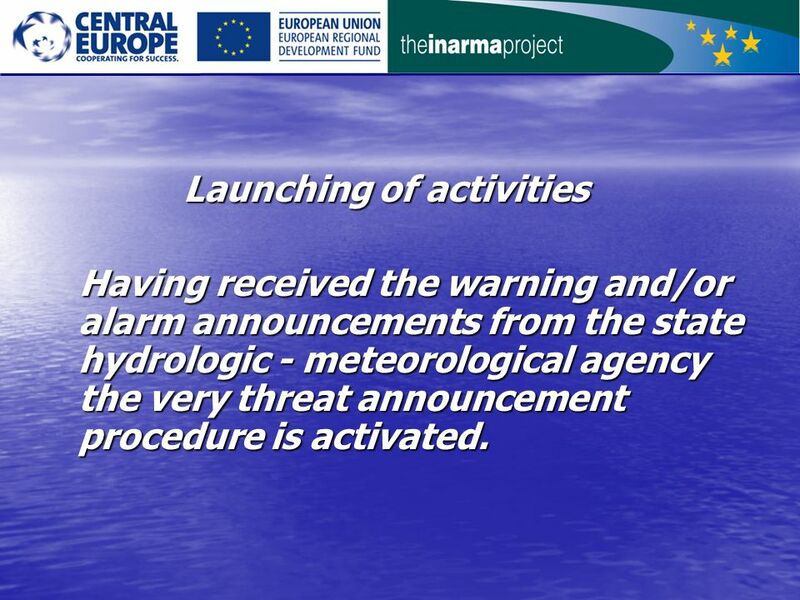 19 Launching of activities Launching of activities Having received the warning and/or alarm announcements from the state hydrologic - meteorological agency the very threat announcement procedure is activated. Having received the warning and/or alarm announcements from the state hydrologic - meteorological agency the very threat announcement procedure is activated. 20 Hydrological threat Hydrological threat If the hazard situation concerns the exceeding of warning/emergency levels with the increase tendency on the river gauges, the flood alert is issued. If the hazard situation concerns the exceeding of warning/emergency levels with the increase tendency on the river gauges, the flood alert is issued. 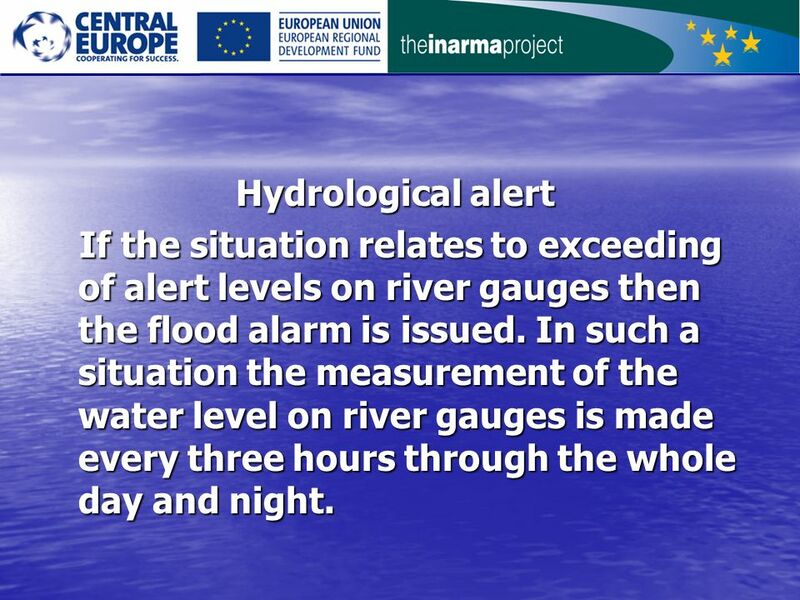 21 Hydrological alert Hydrological alert If the situation relates to exceeding of alert levels on river gauges then the flood alarm is issued. In such a situation the measurement of the water level on river gauges is made every three hours through the whole day and night. If the situation relates to exceeding of alert levels on river gauges then the flood alarm is issued. In such a situation the measurement of the water level on river gauges is made every three hours through the whole day and night. 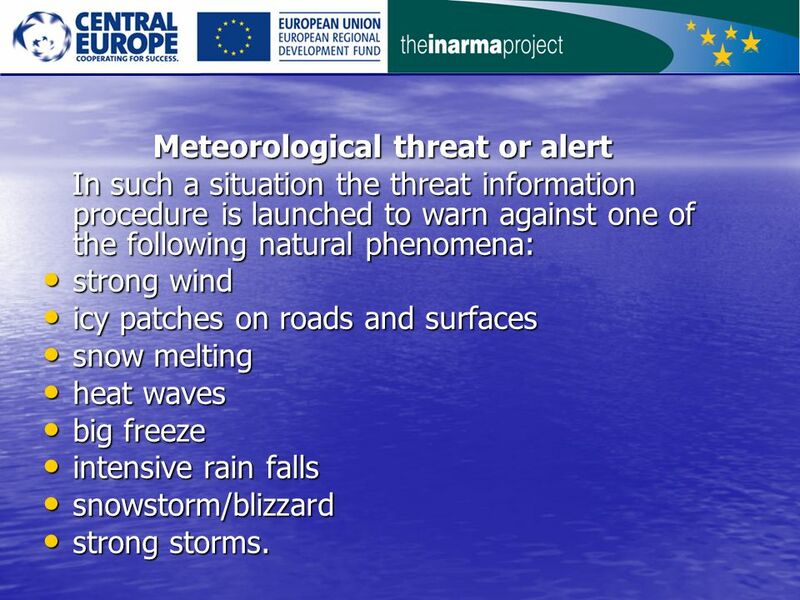 22 Meteorological threat or alert Meteorological threat or alert In such a situation the threat information procedure is launched to warn against one of the following natural phenomena: In such a situation the threat information procedure is launched to warn against one of the following natural phenomena: strong wind strong wind icy patches on roads and surfaces icy patches on roads and surfaces snow melting snow melting heat waves heat waves big freeze big freeze intensive rain falls intensive rain falls snowstorm/blizzard snowstorm/blizzard strong storms. strong storms. 24 In case of arising of flood threats the system of warning and alarming/alerting the population plays a vital role to diminish the loss caused by the flood. 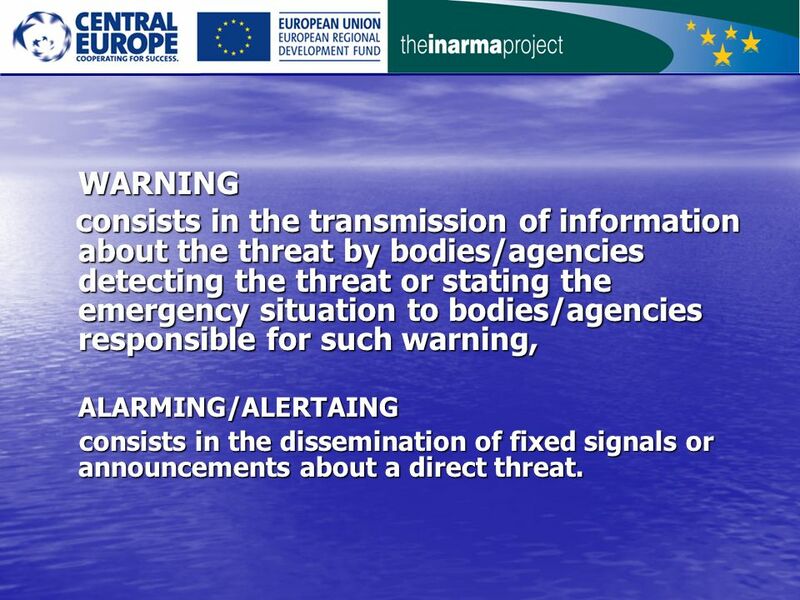 25 WARNING consists in the transmission of information about the threat by bodies/agencies detecting the threat or stating the emergency situation to bodies/agencies responsible for such warning, consists in the transmission of information about the threat by bodies/agencies detecting the threat or stating the emergency situation to bodies/agencies responsible for such warning,ALARMING/ALERTAING consists in the dissemination of fixed signals or announcements about a direct threat. consists in the dissemination of fixed signals or announcements about a direct threat. 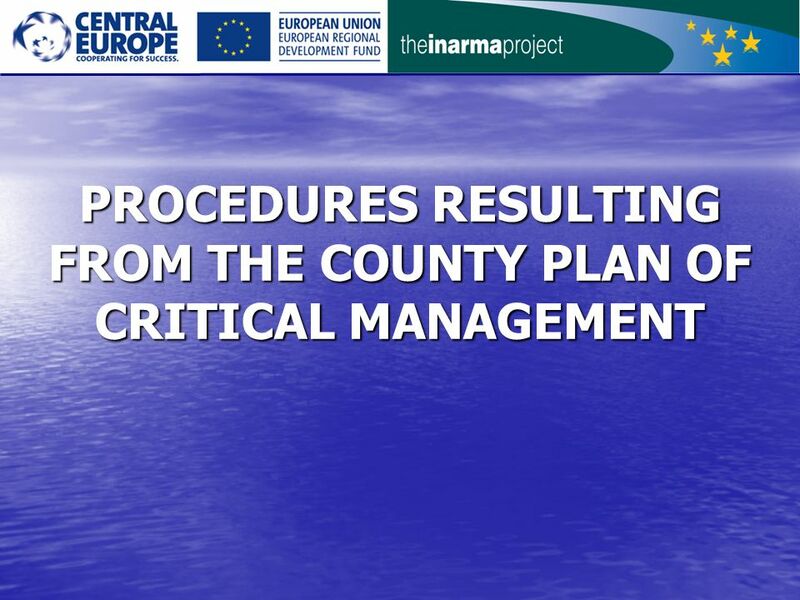 Download ppt "PROCEDURES RESULTING FROM THE COUNTY PLAN OF CRITICAL MANAGEMENT." 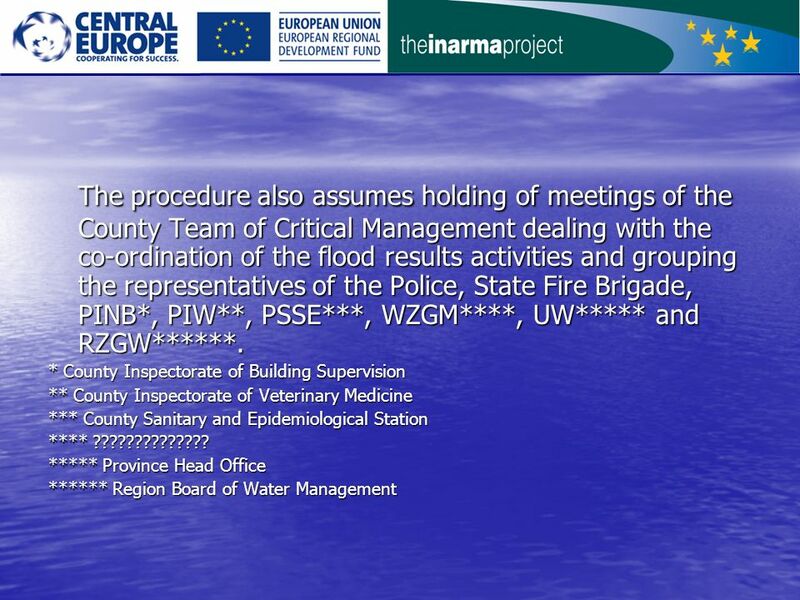 The assessment of preparation and operation of the County Centre of Critical Management. National Response Plan on Natural and Man Made Emergency Situations Emergency Management Department Ministry of Internal Affairs (MIA) of Georgia. FIAR International Insurance- Reinsurance Forum 2013 Nat Cat mitigation programs in Bulgaria Roumen Galabinov. Who to Protect our Borders Henri Boshoff 1. Scope Border Control a reality check. What happened in the past Changing the Guard Changing the Guard again. MANDATE AND ACTIVITIES OF RHMS RS in providing information in hazardous situation Republic Hydro-Meteorological Service of Republika Srpska (one of two. TASKS ASSIGNED BY PŁOCK STAROST TO BE EXECUTED IN CONNECTION WITH THE FLOOD THREAT. The Institution of the Prefect of the Brasov County. Albanian Civil Protection Alfred Prifti Ministry of Interior C O N T E N T - State of Art - Organization - Forest fires emergency, summer Disaster. Control procedures in polish public procurement law Public Procurement Office 2007. LEGAL AND INSTITUTIONAL FRAMEWORK OF WATER RESOURCES MANAGEMENT Semra Fejzibegović, Bc.Sc. In Mech.Eng. Hydro-Engineering Institute Sarajevo, Bosnia and. Honiara City Council Disaster Emergency Response The National Disaster Management Office (NDMO), a government structure in the Ministry of Environment. SCIENTIFIC NETWORKING AND THE GLOBAL HEALTH SUPERCOURSE FOR THE PREVENTION OF THREAT FROM MAN MADE AND NATURAL DISASTERS August , Kaunas, Lithuania.